Speedier than ever with the latest Intel dual-core processor, the Apple iMac all-in-one desktop PC packs a complete, high-performance computer into its all-in-one design, sporting a sleek, professional aluminum enclosure that's joined precisely to a 24-inch glass cover to create a virtually seamless front surface. It's powered by a 3.06 GHz Intel Core 2 Duo processor, which includes an amazingly fast 1066 MHz front-side bus speed and super-sized 6 MB L2 cache. This dual-core processor also provides an optimized, multithreaded architecture for improved multitasking, video, and gaming performance. And this iMac also gets a boost in video processing power from the NVIDIA GeForce GT 130 graphics processor with 512 MB of DDR3 SDRAM of discrete video memory. 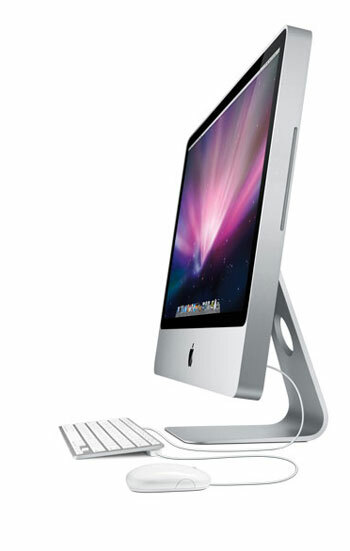 Designed with a recyclable anodized aluminum frame and glass cover, the iMac is friendlier to the environment. 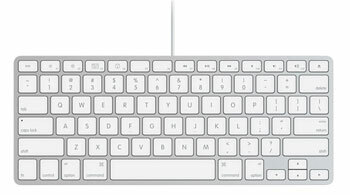 The iMac also features an ultra-thin aluminum Apple Keyboard--with dedicated keys for Mac features such as brightness, volume, eject, play/pause, and Expos¨¦--as well as the wired Mighty Mouse. It's pre-loaded with Apple's Mac OS X 10.5 Leopard operating system, which enables easy backup of your most important data via Time Machine, a redesigned desktop that helps eliminate clutter. It also comes with the iLife '09 suite of applications--including iPhoto, iMovie, Garageband, and iTunes--and the newest version of the fast-loading Safari web browser. 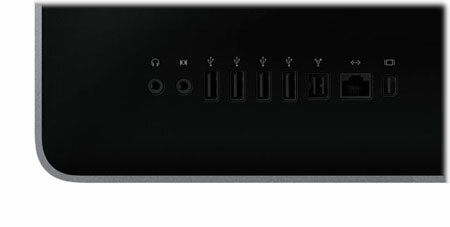 Hardware features include a 1 TB hard drive, 4 GB of RAM (with an 8 GB maximum capacity), 8x SuperDrive for burning movies to DVD and music mixes to CD, integrated 802.11n wireless LAN, Gigabit Ethernet wired networking, and Bluetooth 2.1+EDR connectivity. With its anodized aluminum frame set upon a sleek pedestal, the new iMac instantly transforms your workspace from cluttered desktop to brilliant display podium. Because the iMac's housing is made from a single sheet of aluminum, you won't see any seams or screws except for a single compartment on the bottom that provides easy access to the memory slots. The glossy widescreen 24-inch glass display makes photos and movies come alive with rich color. And the built-in iSight camera and microphone are integrated so neatly you barely notice they're there. Aside from the design details, the iMac is also friendlier to the environment with highly recyclable and durable materials including scratch-resistant glass and professional grade aluminum. The compact keyboard's ultrathin anodized aluminum enclosure features low-profile keys that provide a crisp, responsive feel. With its elegant anodized aluminum enclosure, the new Apple Keyboard looks equally at home in your living room or on your desk. Just connect it to the USB port on your iMac and start enjoying the crisp, responsive feel of its low-profile keys. This compact keyboard also includes special function keys for Mac features such as brightness, volume, eject, play/pause, Expos¨¦, and more. Two USB 2.0 ports provide high-speed connectivity for your iPod, Mighty Mouse, digital camera, and other USB-based electronic devices. The Intel Core 2 Duo's 128-bit SSE3 vector engine handles 128-bit computations in a single clock cycle, accelerating data manipulation by simultaneously applying a single instruction to multiple data. And its two execution cores are designed to share resources and conserve power, helping it to achieve higher levels of performance since it uses fewer watts. The humungous 1 TB Serial-ATA (SATA) hard drive (7200 RPM) quickens the pace with a higher speed transfer of data--akin to FireWire and USB 2.0. The 4 GB of DDR3 RAM (two SO-DIMMs of 2 GB) have an industry leading 1066 MHz speed, and the RAM capacity can be increased to 8 GB. The 24-inch widescreen TFT active-matrix LCD offers a resolution of 1920 by 1200 pixels. It has a brightness rating of 385 cd/m2 (candela per square meter), a contrast ratio of 750:1, and a viewing angle of 160 degrees (both horizontal and vertical). Offering 512 MB of discrete DDR3 SDRAM video memory, the NVIDIA GeForce GT 130 is ideal for 3D graphics-intensive games or pro applications like Aperture and Motion. 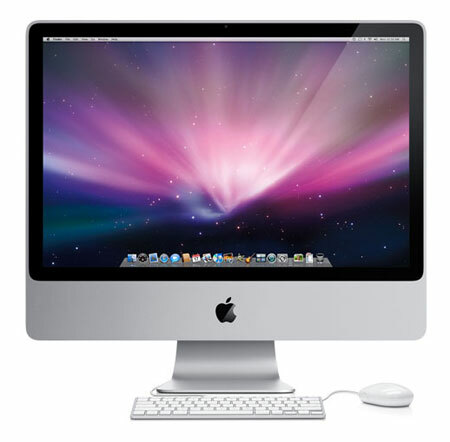 The energy-efficient hardware components in the iMac work hand in hand with Mac OS X to create a system that can dynamically adjust power consumption to reduce the energy used overall. The iMac uses an advanced power management system leveraged from the technology that makes the most of battery life in Apple's MacBook family. To reduce energy consumption, the iMac hard drive spins down automatically when inactive, and it also decides which processor--CPU or GPU--is best suited to perform a task efficiently. That means when iMac is idle, it's using as little power as possible. 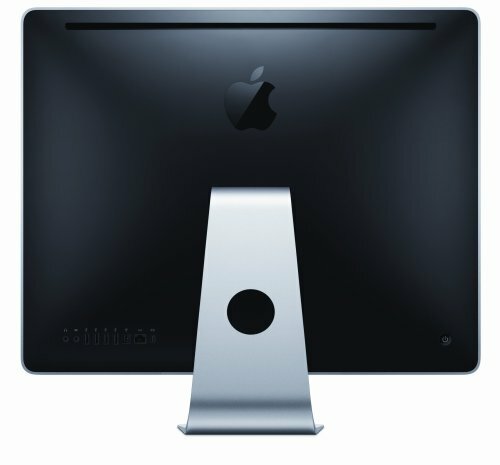 Apple engineers have worked hard to eliminate many of the toxins that are a common part of desktop computer manufacturing, such as choosing arsenic-free display glass for iMac. They have also removed brominated flame retardants (BFRs) and polyvinyl chloride (PVC) from circuit boards, internal cables, connectors, insulators, adhesives, and more. And the entire iMac computer is integrated into an enclosure made from a single, solid piece of recyclable aluminum, while the display is made of recyclable glass. The Mac mini meets the stringent low power requirements set by the EPA, giving it ENERGY STAR certification. 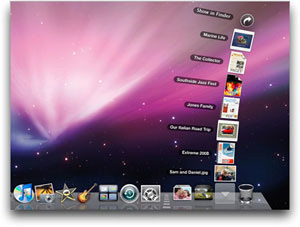 In addition, Mac mini meets the latest efficiency requirements of ENERGY STAR Version 5.0 Specification for Computers before its July 2009 effective date. It has also earned the highest rating of EPEAT Gold. 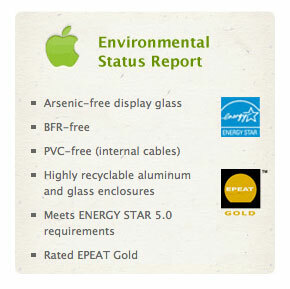 The Electronic Product Environmental Assessment Tool, or EPEAT, evaluates the environmental impact of a product based on how recyclable it is, how much energy it uses, and how it's designed and manufactured. Preloaded with Leopard, you'll enjoy enhanced productivity and a clutter-free desktop (thanks to the the redesigned 3D Dock with Stacks). Leopard's new desktop includes the redesigned 3D Dock with Stacks, a new way to organize files for quick and easy access with just one click. Leopard automatically places web, email and other downloads in a Downloads stack to maintain a clutter-free desktop, and you can instantly fan the contents of this and other Stacks into an elegant arc right from the Dock. The updated Finder includes Cover Flow and a new sidebar with a dramatically simplified way to search for, browse and copy content from any PC or Mac on a local network. It also comes with the iLife '09 suite of applications that make it easy to live the digital life. Use iPhoto to share entire high-res photo albums with anyone who's got an email address. Record your own songs and podcasts with GarageBand. Break into indie filmmaking with iMovie and iDVD. Then take all the stuff you made on your MacBook and share it on the web in one click with iWeb. For the better part of the last decade I have thought about buying a Mac, but never did. Recently I came to a decision point for my 6 1/2 year old Dell and what to buy next. Vista stinks so I did not want another Dell. My wife has a MacBook and she loved it which helped with the decision making. The main reason I bought this version iMac was due to the integrated graphics, fast processor and huge hard drive. In addition to just replacing my old Dell, this computer will be used to edit HD Video from my Canon HF10. The speed of the computer is great and the screen is magnificent! Used PCs all my life, ever since DOS days, ran an 85 user Local Area Network. Still have 3 PCs on my home network. Some techy friends have recommended Macs lately. iMacs are like potato chips in that you can't have just one. I bought an iMac 20" to try and I LOVE IT! Another soon (late 2008 and early 2009) followed, then a Macbook. When Apple came out with this 24" with more memory, the bigger screen, and a larger hard drive I added it to my home network. I thought the iMacs 20" screens were beautiful and looked much larger than their stated size would seem. The new larger 24" screens are amazing! I sound like a commercial BUT anyone who is running Windows (s-l-o-w-l-y) and is sick & tired of the virus and trojan horse attacks; it is time to leave the PC swamp or to add a Mac! Be warned, you can't have just one. This is a great computer with a beautiful display. As Apple claims, "It just works." I plugged in the power cord, connected the keyboard and mouse and I was good to go. The Apple store offers a free 1hr course that guides beginners and PC converts around the basic functions. You can make a reservation online and they will field your questions during class. If you're not near an Apple store you can watch a tutorial at their website. It isn't cheap, but it has almost all of the software that you might need. Each program opens with its own tutorial and the speakers are built in. iMovie blows away anything that I have worked with for home DVD production. It will process up to 1920x1080 HD camcorder video with all of the fancy titles and transitions. I added Nikon Capture NX 2 for high-end photo processing, Intego VirusBarrier X5 for peace of mind and I'll probably add Microsoft Office 2008 for Mac next month because I do scientific research and there's no beating Excel for that. I really wanted a quad-core rather than dual-core processor, for the money spent, but Mac is a whole different world from PC. Their software is all 64-bit and highly optimized to perform with specific hardware configurations. You'll never know the VirusBarrier is running and it scanned a 1TB drive in about 5 minutes. I used to cringe when McAfee VirusScan started up on my PC because it choked the system's performance and took hours to run. 1. I replaced the small keyboard with the full-sized Apple version. I need a number pad and some of those other missing buttons. 3. Not all of the buttons work the way they do in PCs. So look through the keyboard shortcut section in System Preferences for familiar key commands and check the blogs for helpful tips. 4. Software that was written for PowerPC based Macs will not work on Intel based Macs. You'll have to upgrade. 5. Many older printers are supported, like my HP DeskJet 930C, but only for basic printing. I plugged it in and it worked, but I won't get all of the color and paper options unless I buy a new printer with Mac software. I am just about to replace the harddrive on my second imac. In the first one, the power supply shorted out and melted the screen. It was 18 months old so apple said they would not fix or replace it. The current one was purchased 375 days ago - 10 days out of warranty - and the hard drive just died. Again, Apple says they will not cover anything. I get to purchase a new harddrive. I have owned dozens of PCs for myself and my company and never had hardware problems like these. The wonderful mac software is good if you don't know much about computers and are willing to let apple decide how you should use a computer. If you have been using computers and don't need Uncle Mac deciding what you should do and how you should do it, get a PC. I find them easier PCs easier to control because the software lets you do what you want. This review is by someone who knows little about computers- which is why I am so impressed by the product- It functions perfectly virtually right out of the box- none of my numerous PC's have ever done that. As someone who has only owned windows based laptops from various manufacturers over the past decade- I was shopping for exactly the same thing. I thought I would look at what Apple had to offer and walked out with this- the 24"- I opted for the $1799. version and could not be happier. It has taken some getting used to - but Apple has offered excellent telephone support so far- and I have found that even an ignorant about computers as I am that the O/S is actually easy to adjust to. I am a very visual person, but demand function over form if a choice has to be made- luckily I found this iMac- Form AND Function all in one. I have been extremely pleased with the new iMac 3.06 GHz Core 2 Duo 24-Inch monitor. I am a long-time Mac user, so this review is from that standpoint. I do use PCs at work (Windows XP). I buy a new computer about every 4-5 years, so I am understandably impressed with the performance of any new machine I purchase...take that into account also. I use the computer for photo processing (iPhoto, Photoshop), limited video processing, limited use of Garage band, some web publishing, and media serving to my Apple TV, including DVD rips and conversions. My last desktop machine was an iMac G5 1.8 GHz 20" purchased in late 2004. As expected, the new machine is a considerable step up in performance. I have been very happy with the video conversion speed. Judging by the benchmarks, the Mac Pro would be considerably faster still...but if I had opted for that I'd be considerably poorer. For my purposes, the laptop Superdrive and the Core 2 Duo are fast enough. Stressing the computer by ripping a DVD, converting another DVD, playing iTunes with the visualizer on, surfing the web, and e-mailing all at once didn't cause it to hiccough at all; it runs cooler than the old G5 iMac. Temperatures were generally in the 50s C, except for the northbridge, which peaked at about 74C. The fans are very quiet, even under load. The screen is fantastic. I use dual monitors at work, and I've grown used to all that screen real estate. The 24" monitor is great in that regard. As far as the glossy screen goes, I've had no problems with it, and the computer is in a room near south facing windows. I thought it would be an issue, but it has not proved to be. I note that finally Macs are shipping with competitive amounts of RAM and hard drive sizes. This is the first Mac that I've purchased that didn't need an immediate RAM upgrade. Certainly, for my purposes, the 4GB standard RAM is adequate. The 1 TB drive is certainly welcome as well, as I rip more of my movies into the computer. While the video card won't impress dual-SLI gamers, it's pretty good (this machine has the NVIDIA GeForce GT 130 with 512 MB RAM). I do have XP installed and can start up in Windows with Bootcamp (restart while holding option is the easiest way). The machine runs Crysis very smoothly with everything cranked except the resolution: I'm running it at 1280 x 960, rather than 1920 x 1200. Again, good enough for me....my wife would say too good, as she might be happier if I didn't play Crysis...but I just had to know how it played. The standard keyboard is fine for my purposes. I've been using my MacBook and am used to the flat keys and lack of numeric pad. If you do a lot of data entry, you should consider purchasing direct from Apple and substituting the extended keyboard with the numeric pad at no cost. I have never appreciated Apple mice. Opinions regarding mice and keyboard are very subjective, and everyones' preferences are different. I have a Logitech MX Revolution and like it a lot. It works fine with the iMac without installing the substandard Logitech software. The lack of Firewire 400 did cause me to buy a couple of Monoprice cables so I could hook up my video camera and my external drives. They work fine and were, as usual for Monoprice, dirt cheap. Budget an extra 12-15 bucks if you have legacy Firewire 400 devices that you plan to use with new Macs. As far as included software, I continue to be impressed. I have always liked OS X, and really like Leopard. Supposedly, the NVIDIA motherboard in the new generation iMacs will work better with at least some programs in Snow Leopard, when that comes out, but that's speculative at this point. The new machine found my network, including my network printer, immediately. It found my wireless network for testing purposes...I connect to my network using gigabit ethernet. I installed Cisco VPN provided by my company, and it worked fine. I run my work PC from home via Microsoft Remote Desktop, and it works well. I use the iLife programs every day. Apple Mail works fine as a basic e-mail program, and that's what I use even for my work mail, which is on an Exchange server. Outlook (Entourage on the Mac) is more sophisticated and complex...but I don't use any of the advanced features, so I tend to stay away from it. I use MobileMe to synchronize my 4 macs so my calendars, etc. are all up to date. I use iPhoto for most of my family photo activities, although sometimes I do pull up Photoshop for some more sophisticated editing.